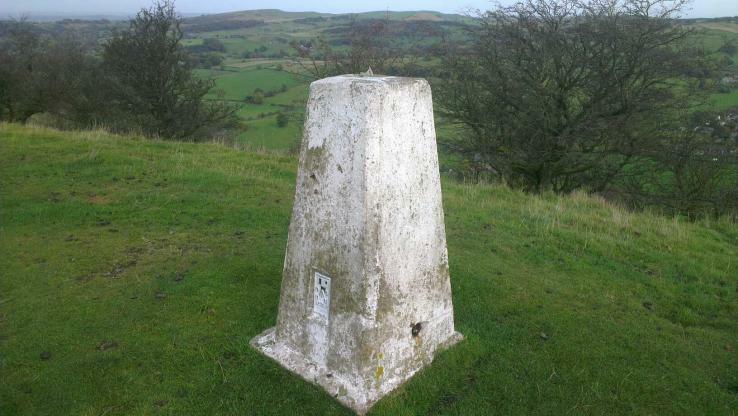 Is ranked joint 1307th with 23 other trigs (more). One of the top corners is worn away. 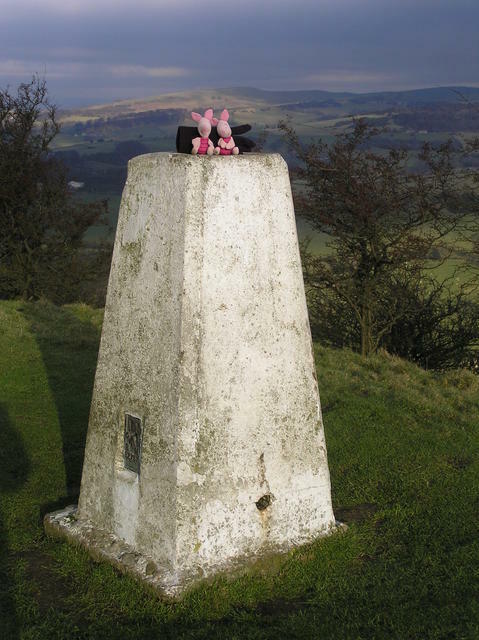 nice walk from Bollington visiting White mary. All intact. Fog lifting (or so we thought - came right down again, and stayed all day. Thick and very wet. 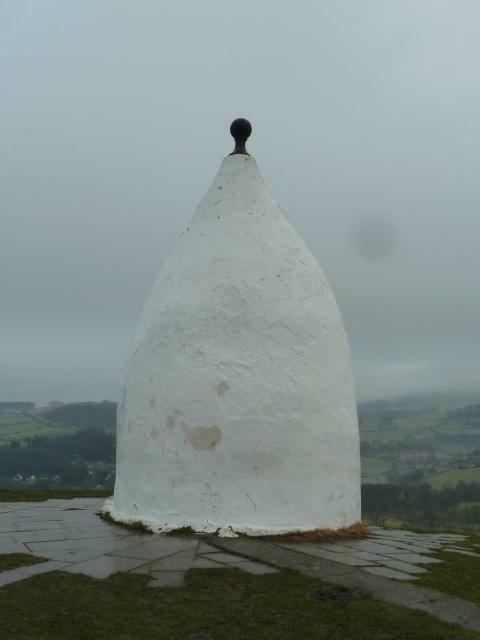 Went along to White Nancy which has had a recent coat of white paint. Chatted to a local about the various paint jobs its had over the years. Memorial to the Battle of Waterloo. 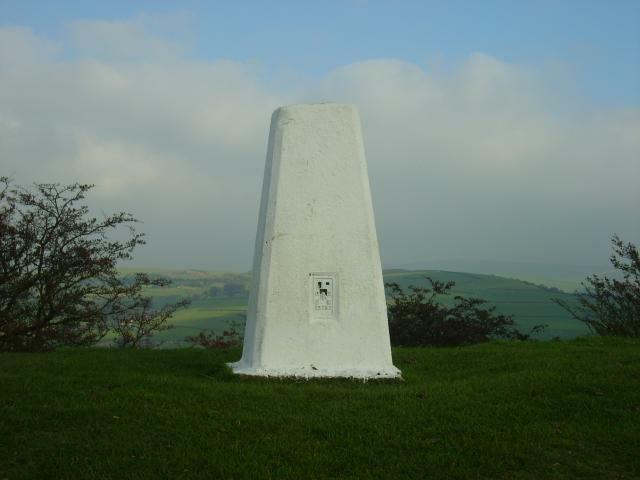 Parked in entrance to quarry on Lidgetts Lane and walked east up footpath to Kerridge Hill then south towards trig point. 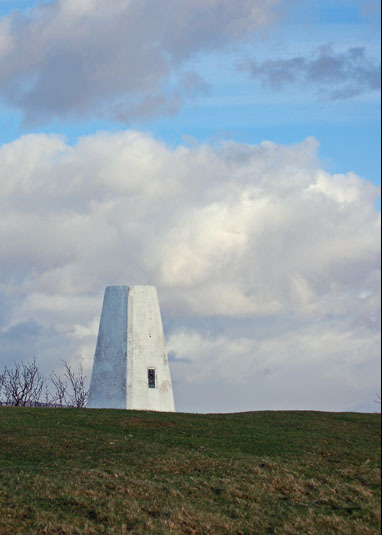 Must return in better weather to walk all the ridge to White Nancy. 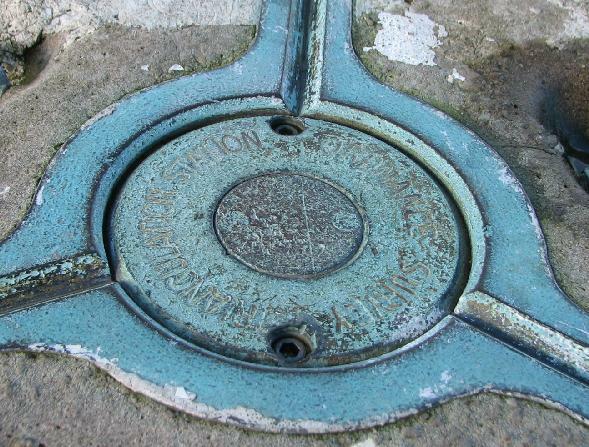 2nd Trig south along The Gritstone Trail which you have to divert off the main Trail along the ridge to the pillar. To regain the Trail you can descent, as I did, down the east facing slope of the Kerridge Ridge, which is insanely steep. 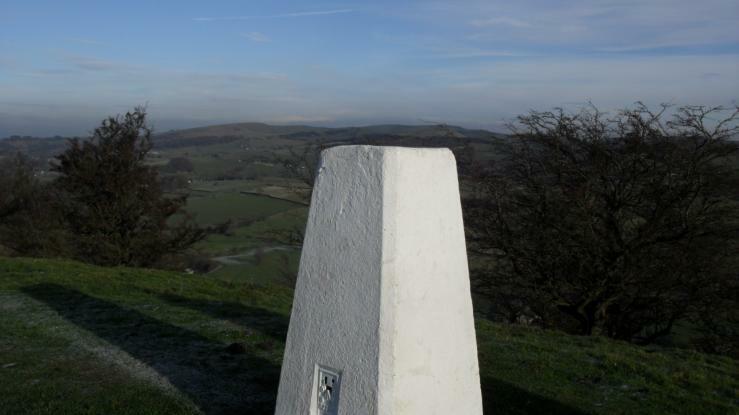 Similar views to the east and west as Sponds Hill except Manchester can't be seen, but Kinder Scout can. 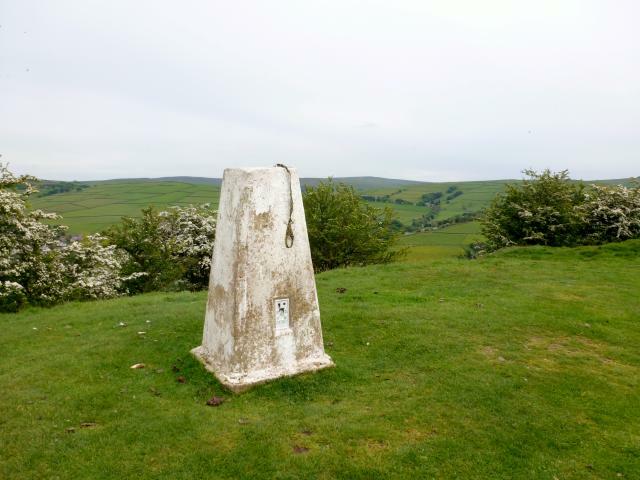 Parking in Lidgetts Lane the along PROW, Pillar good condition, nice views along to White Nancy next. 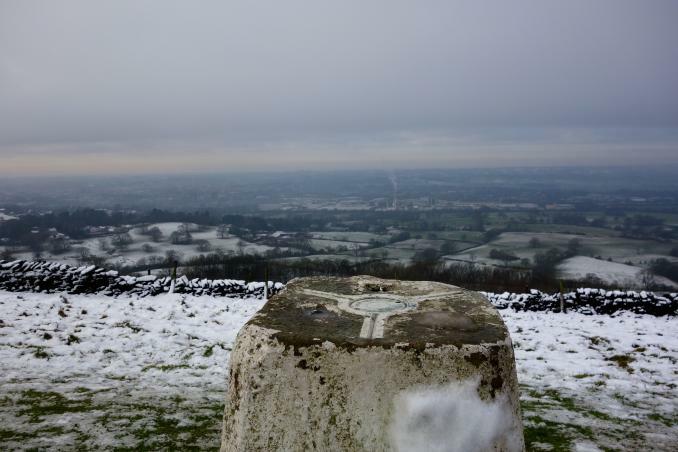 From Billinge Hill in beautiful icy pasture to the damaged Kerridge then across to the oasis of quiet wildness from Vale Royal to Rainowlow via Lamaload, snow eventually moves in later. 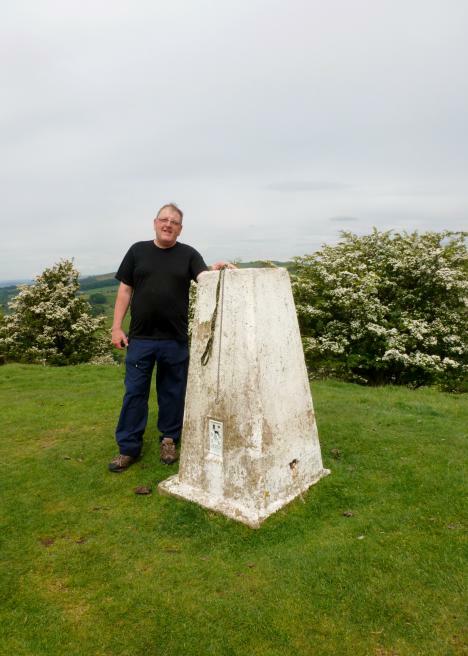 My 300th we walked up from Kerridge End on my birthday day off.Parking opposite Lidgetts Lane enough room for 2 cars.Brilliant walk in great company taking in White Nancy along the way,called in at The Flower Pot in Hurdsfield for a pint on the way home. 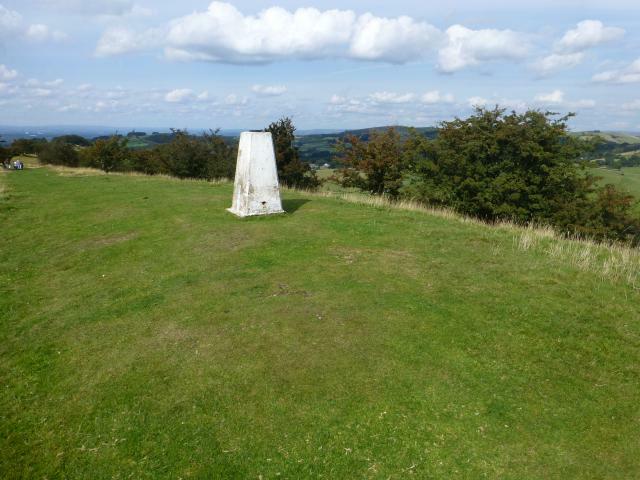 Second of two trigs, walked up from the S and futilely looked for the trig near the quarry edge, only to walk to the more obvious higher ground further up the ridge. Great views W, so a great place for lunch. 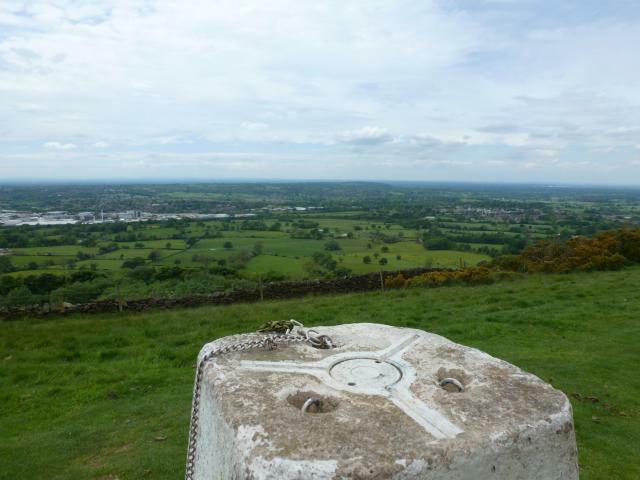 Saw planes landing at Manchester Airport, Jodrell Bank moving around and the Welsh Hills. Debated about the hills SW being the Wrekins. 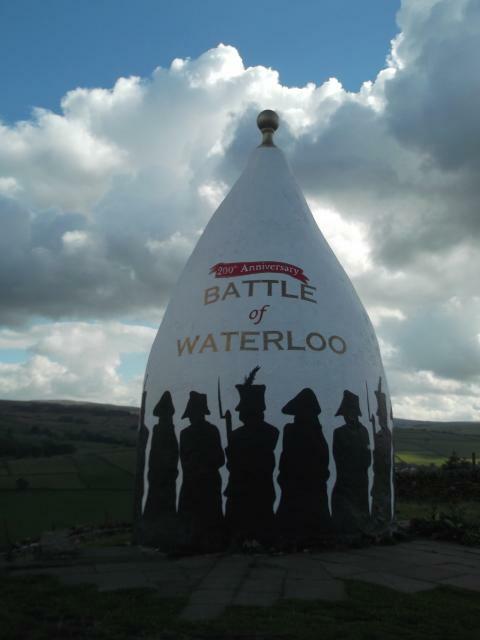 On to the White Nancy monument, all painted up celebrating the 250th anniversary of the Battle of Waterloo. Even on a hazy day, the view was great. 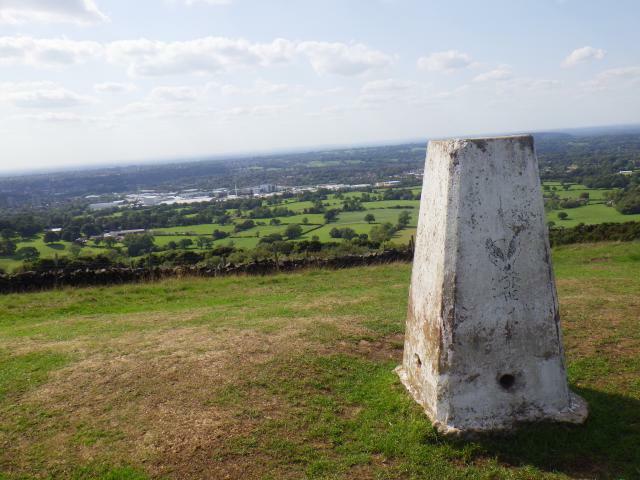 Good clear view across Cheshire plain. Still in shorts in November! 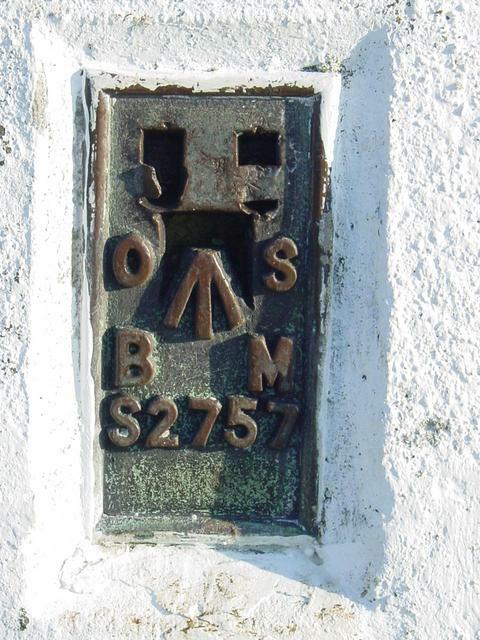 Surprisingly for such a popular spot the OS cap is still in place - shallow indented letters and white painted. Parked on Church Ln / B5470 in Rainow and admired the beautifully kept gardens. 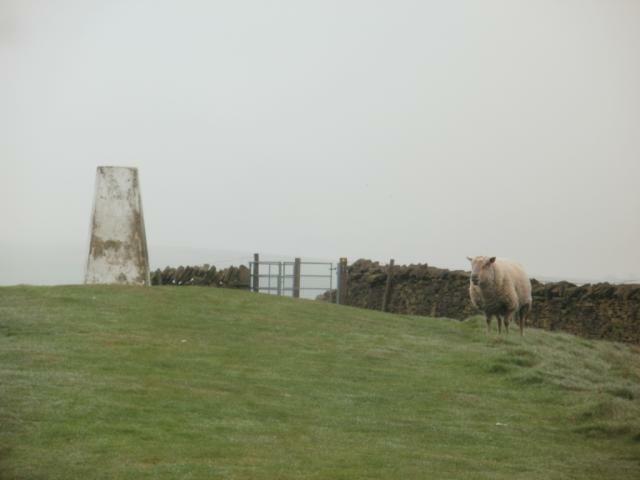 Headed along the tarmac down into the valley and then back up through Brookhouse to Kerridge End. 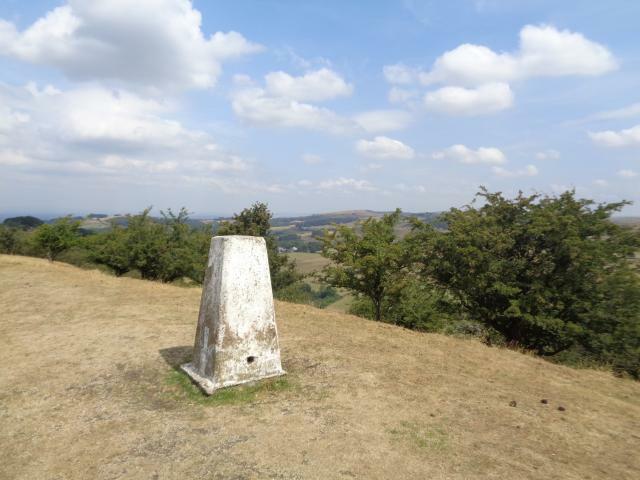 Kerridge Hill can then be accessed from Lidgetts Ln but the signpost for the PROW is hidden beneath bushes !! Take the drive on the right just as the lane begins to turn sharp left. 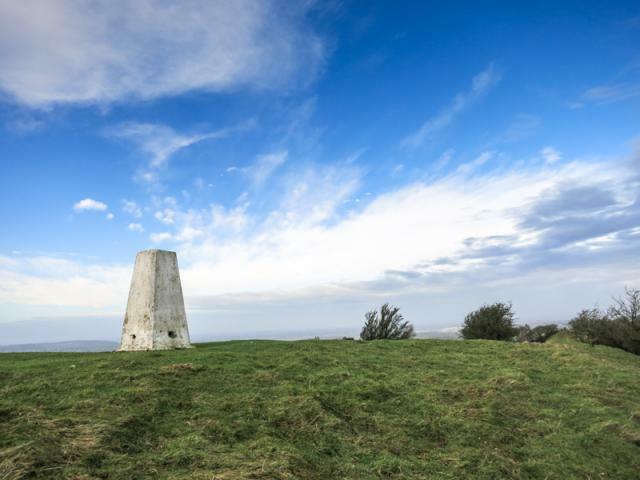 The obvious PROW then steadily climbs to the top. 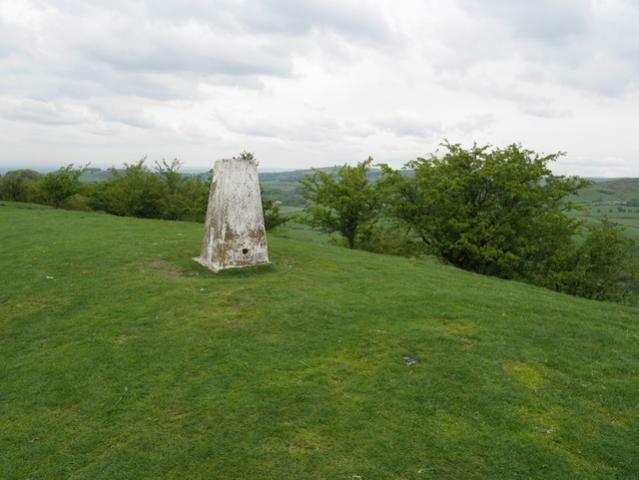 Views are limited due to shrubs / trees until you reach the trig but it is worth the wait. 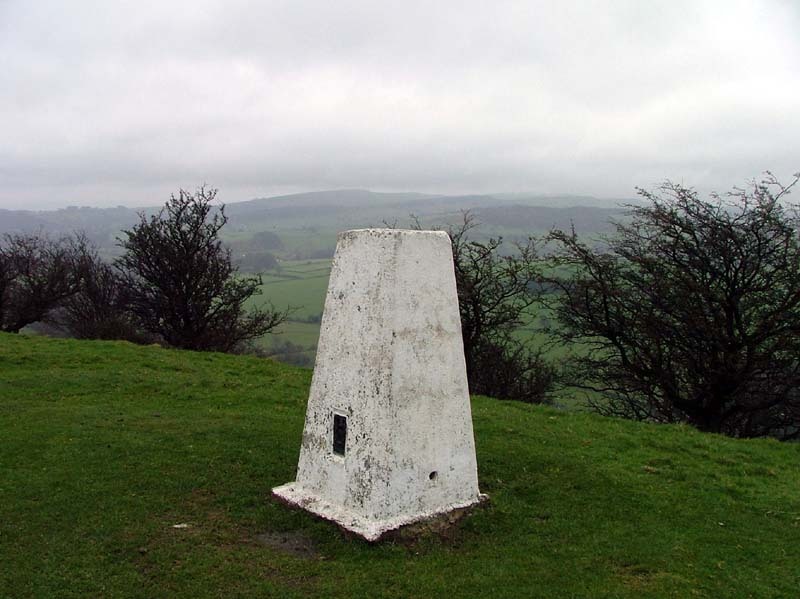 Really contrasting scenery - rolling hills of the Peak District over to the East but urban sprawl of Macclesfield and Manchester on the Chesire Plains to the West. 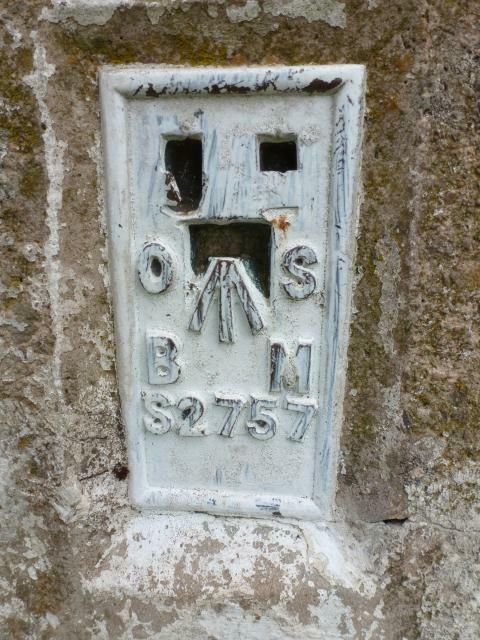 Trig looks to have been repaired on one top corner but it is starting to come away. 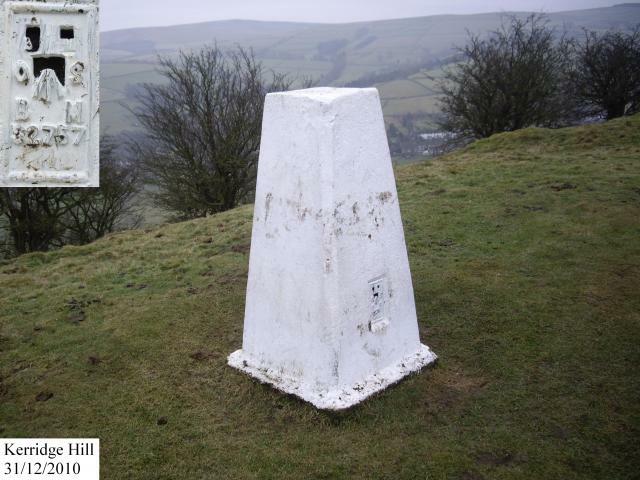 Otherwise good condition with original cap with indented lettering and good coat of white paint. 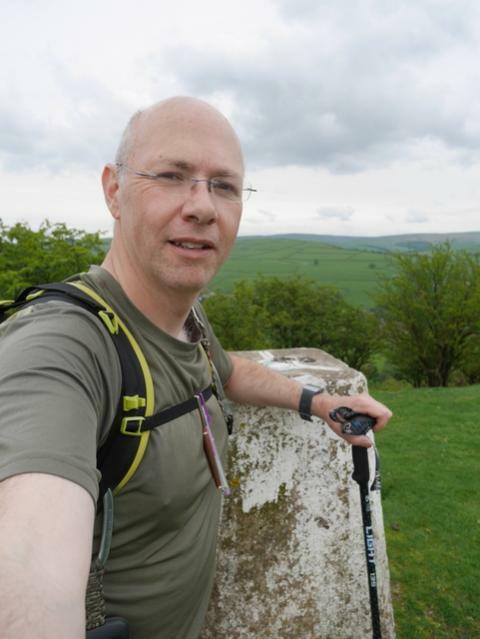 Continued along Saddle of Kerridge to White Nancy before descending steeply towards Bollington and following the Gritstone Trail round to the rather odd Savio House. Thereafter took PROW East through a field full of mellow cows to Oakenbank Ln and back into Rainow. 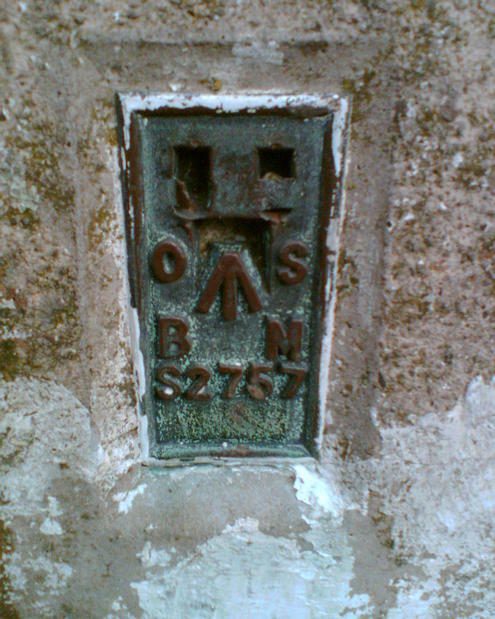 Brass plaque intact. 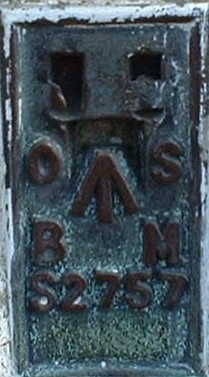 Painted pillar. 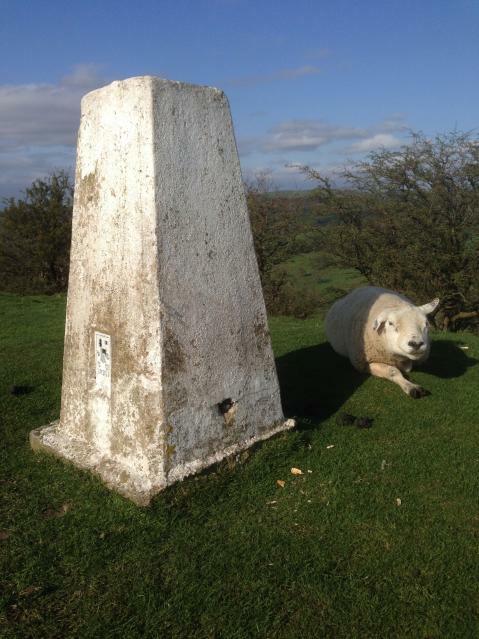 Even had a spare dog lead on top! 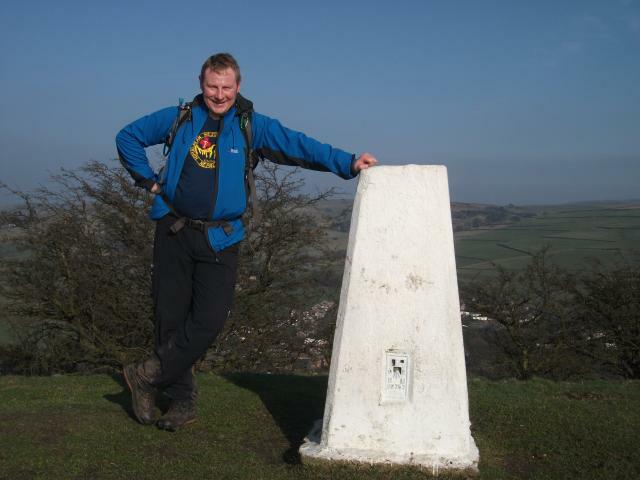 I climbed up onto the ridgeway from Kerridge-end. Very breezy but a nice walk along a manicured path. Good views all around. The painted pillar stands out well. Up here many a time. 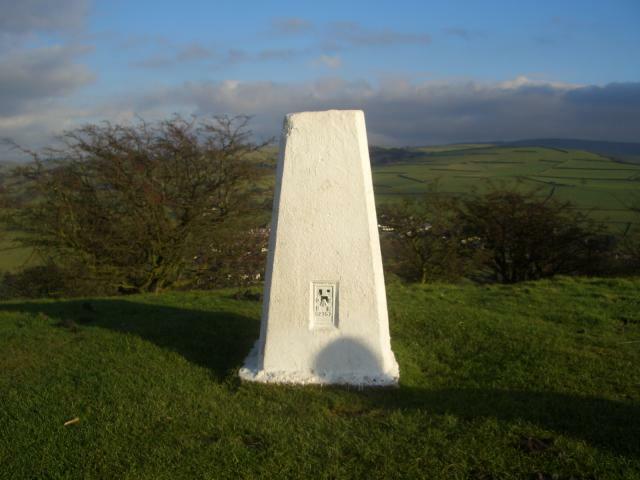 Worked in Bollington. 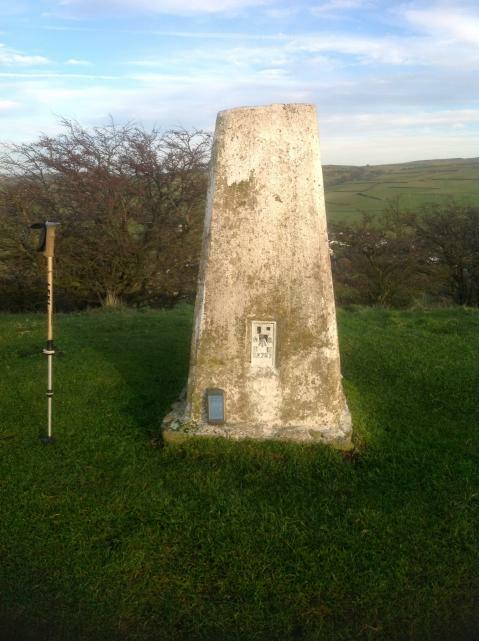 Climbed to White Nancy every lunch hour to get fit for the Alps. 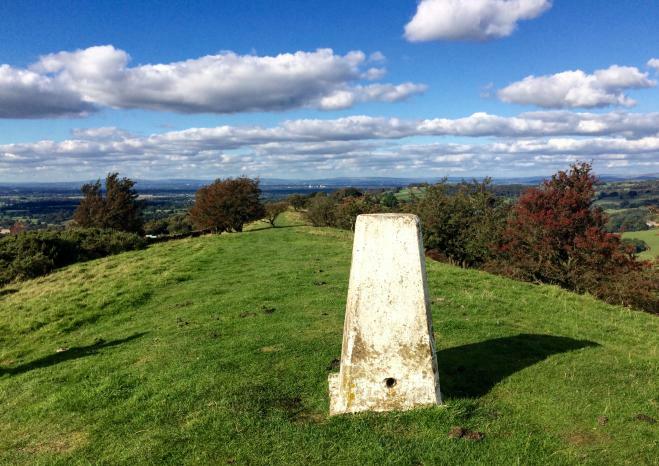 Middle trig pillar of three breaking up my journey home from Stockport. Glad that I made the effort to include this one. 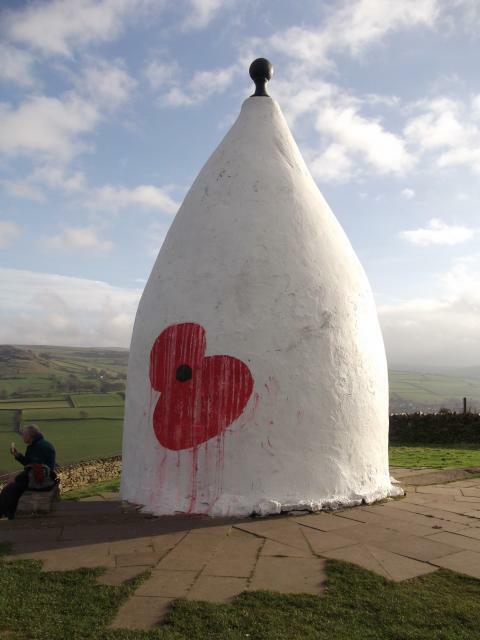 2/3 Back to Bollington and ascended very steep path to White Nancy which had a large poppy painted on it. 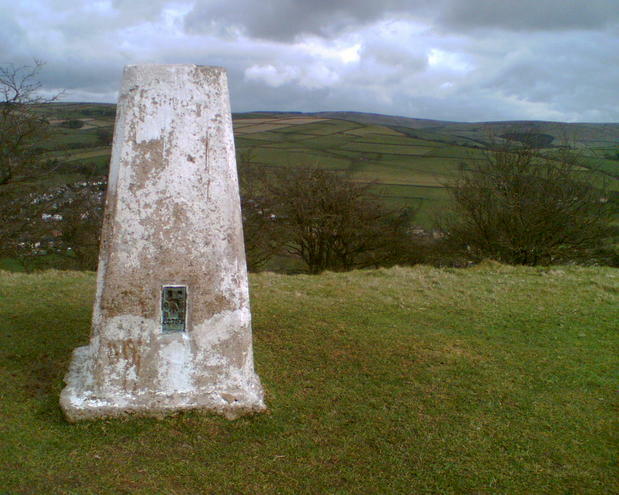 Along the Saddle of Kerridge to the trig point. 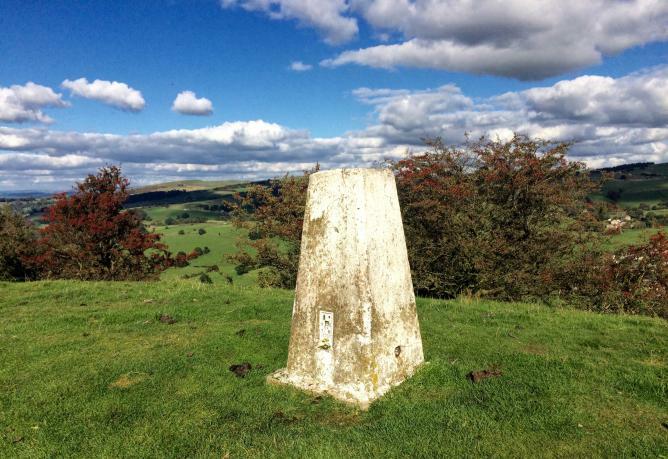 Very good views on a sunny November day.Picked up the Gritstone Trail and on our way to Sponds Hill. 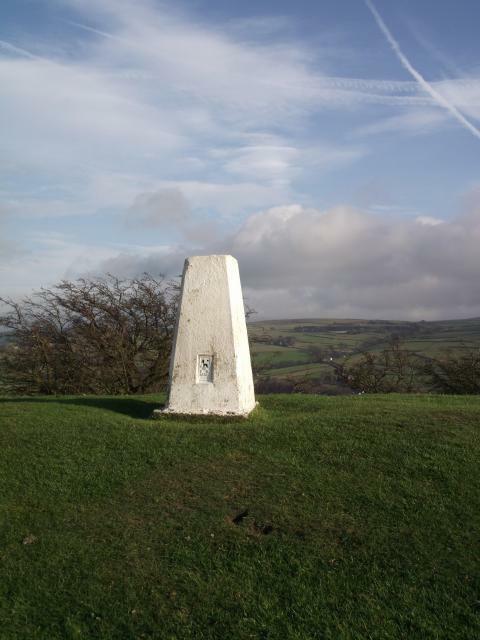 Walked to Kerridge Hill via Nab Head and White Nancy from the car park under the aqueduct in Bollington. 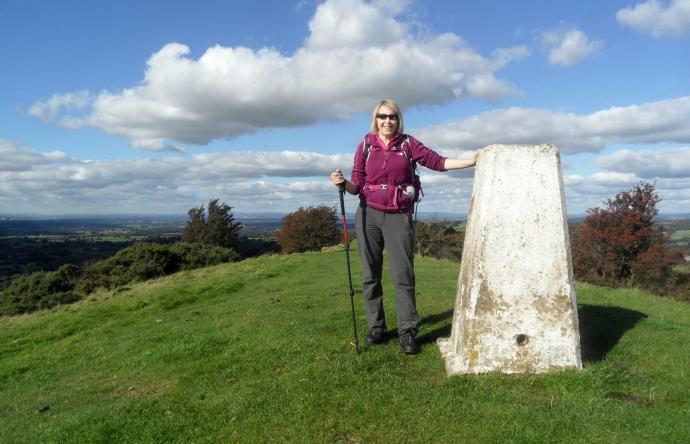 Continued along the Gritstone Trail to Sponds Hill. 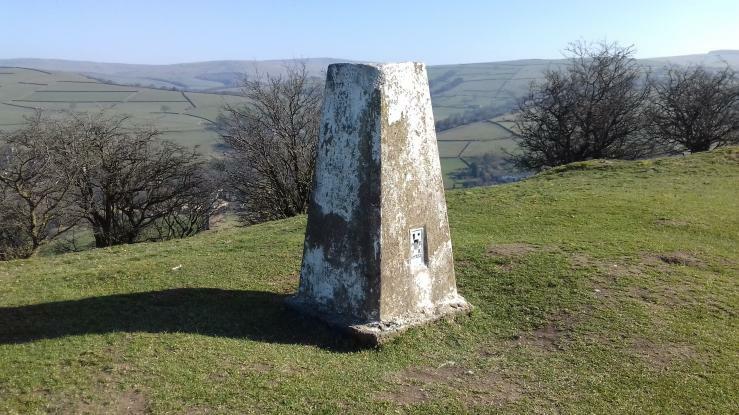 A local(ish) walk on a sunny day - good views. 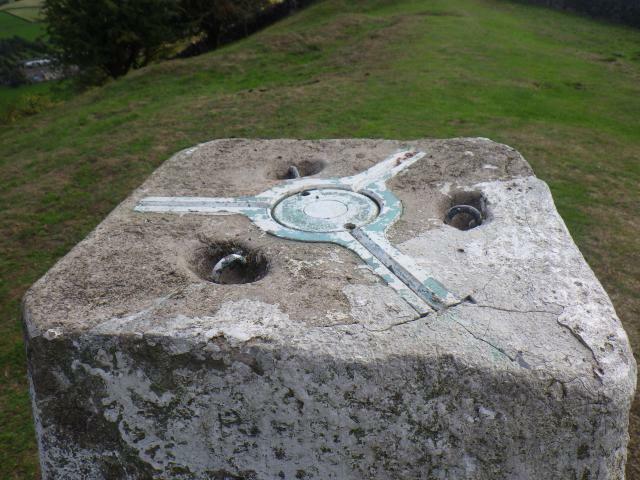 Last minute decision had us take the anti-clockwise route from Brookhouse to visit the Folly at Tower Hill first. Big Mistake! 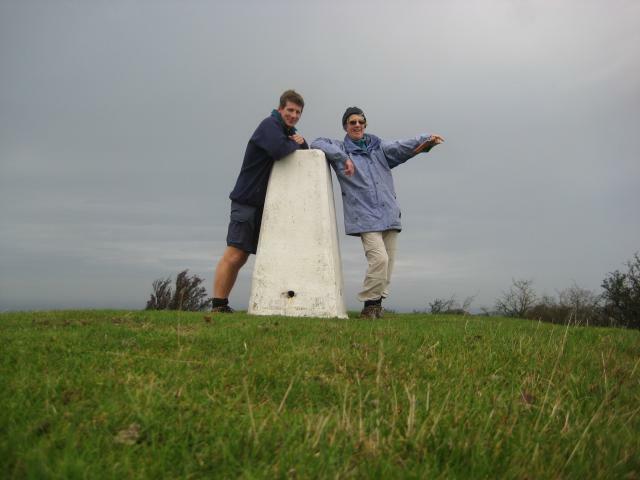 This meant we avoided Hurricane Katia until we reached the ridge at White Nancy, by which time it was laced with rain and hail. A wet and painful experience flavouring my report. And the pub is now closed! 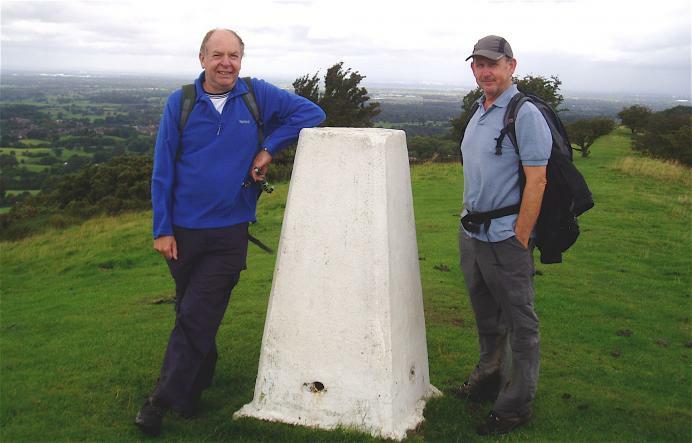 Revisited with mate Mark, this time remembered the camera. I came up to grab the nearby cache. 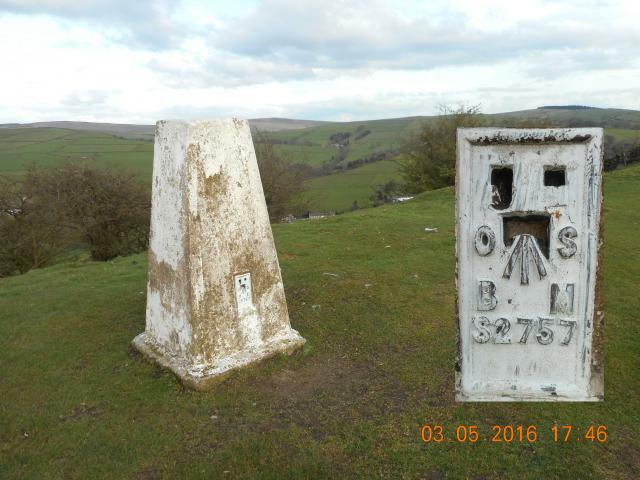 Trig point is all painted white but in good condition. 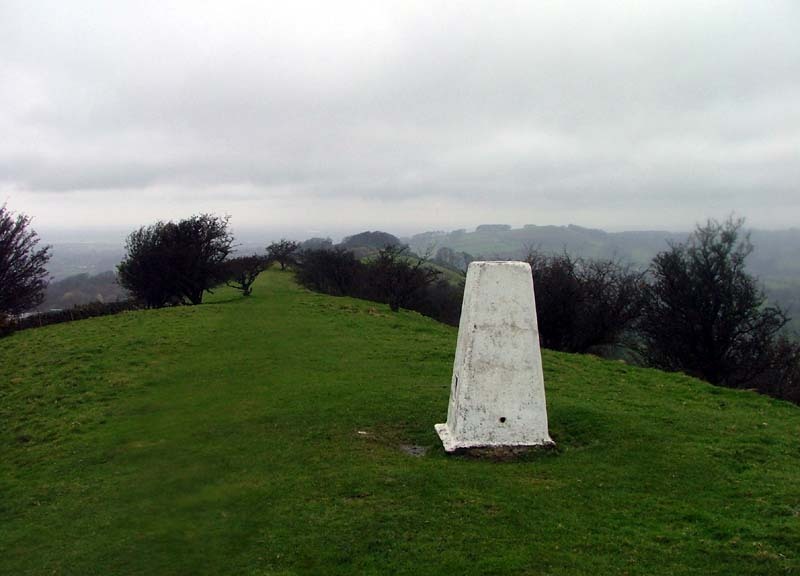 The cloud was low today so no views but I bet they are normally great from here. 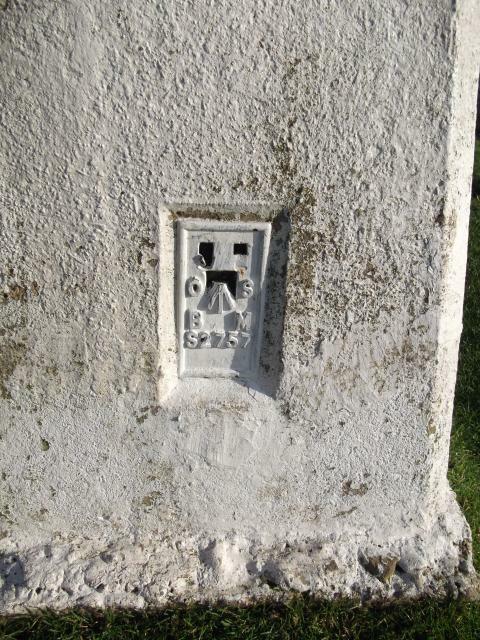 Stop painting the flush brackets! 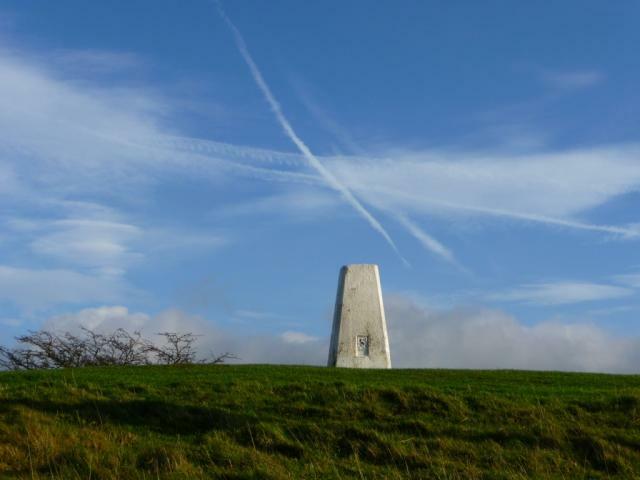 Done on a suuny Autumn day with fine all round views.Reached by the stiff climb up to White Nancy then stayed on the ridge.Liberally painted. 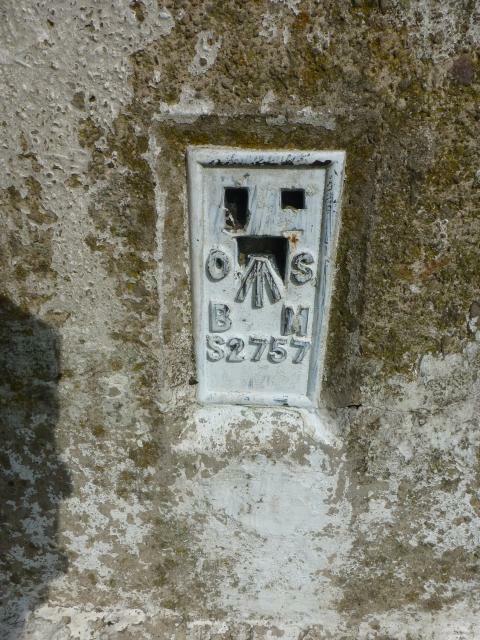 Metal plug [indented letters]. Public. 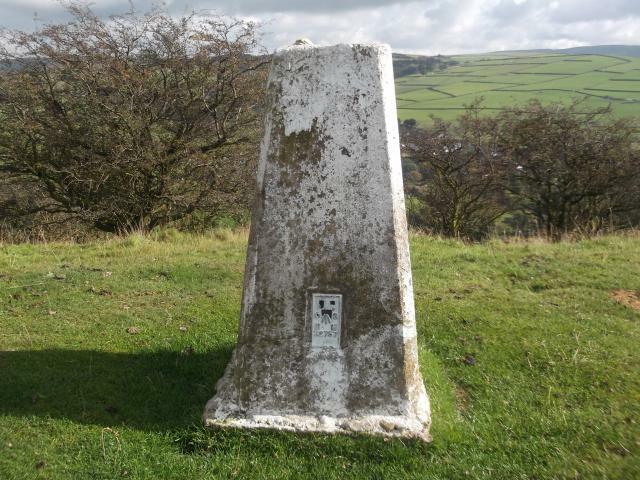 On a public footpath off the Gritstone Trail. 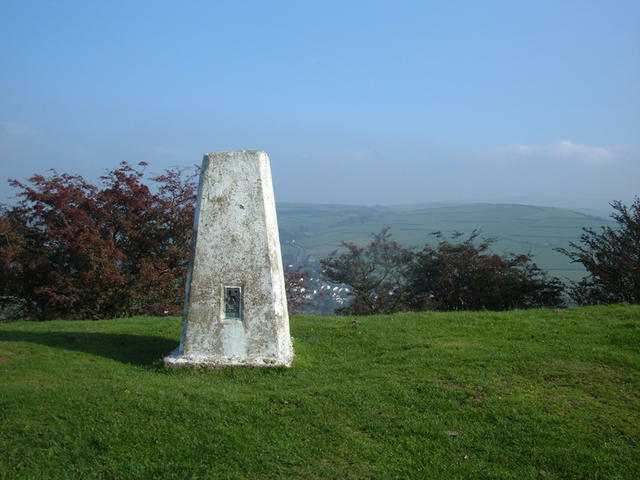 Ascend steeply from Bollington to White Nancy, then make the fine ridge walk up to the trig. Pillar liberally whitewashed, including all metalwork! 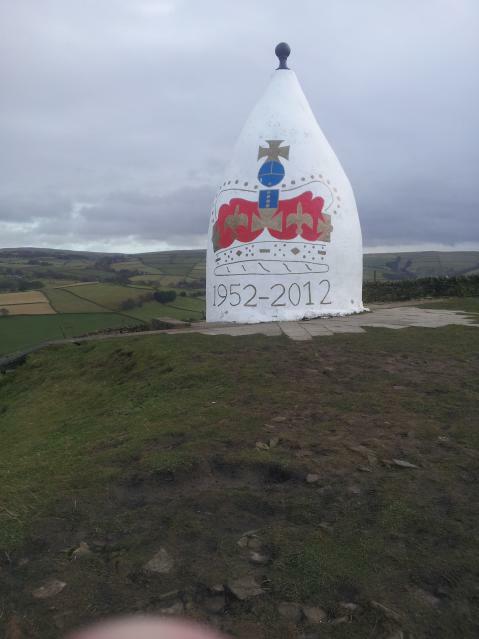 Thankfully, the graffiti 'artists' who have defaced White Nancy haven't yet got this far. 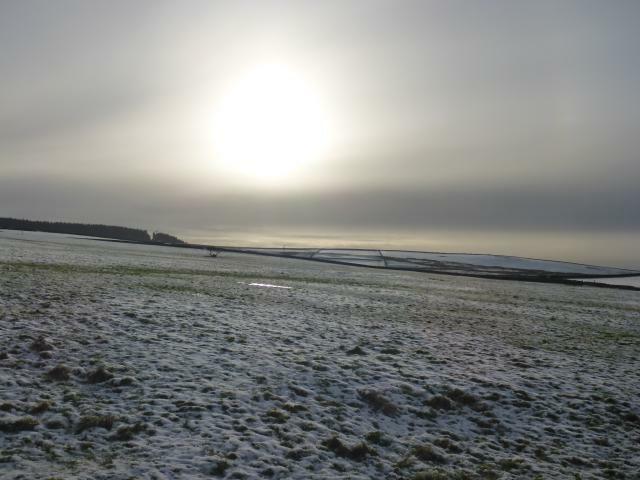 Great little walk in the snow but no real views today. 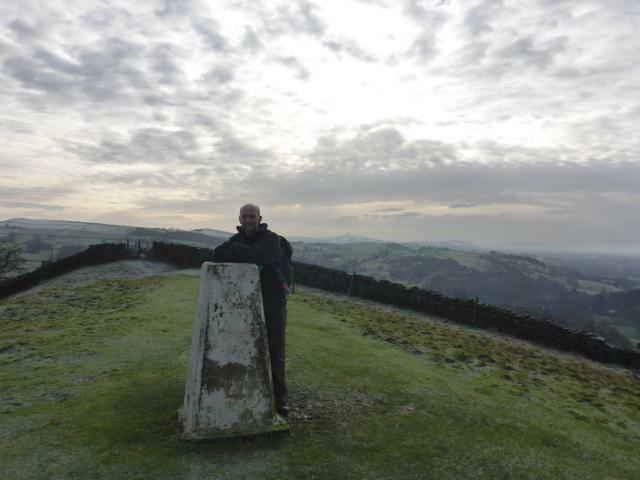 Walked up from Bollington via 'White Nancy' on a very cold day. Lovely views all around. 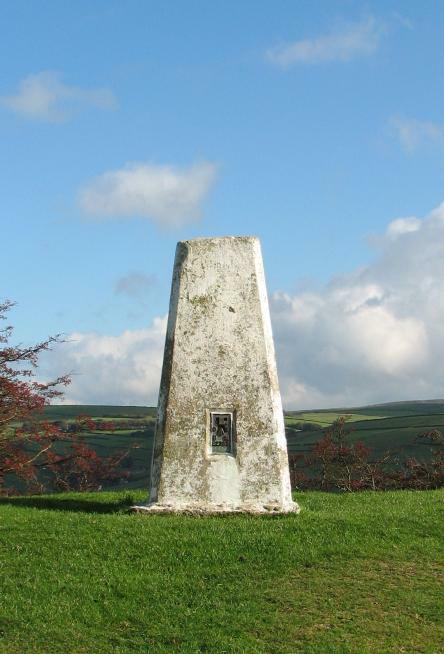 I enjoyed the invigorating short walk up to the ridge then along to the trigpoint. Some patchy sunshine and a strong wind made it all the more refreshing. 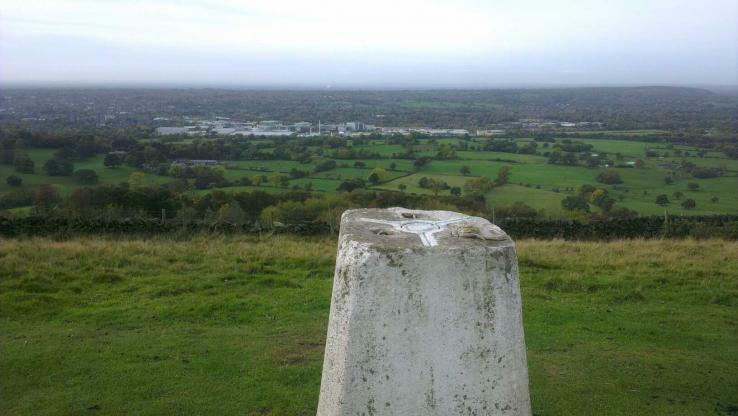 Took in the fantastic views in all directions, and then went for a nice easy find of the nearby geocache. 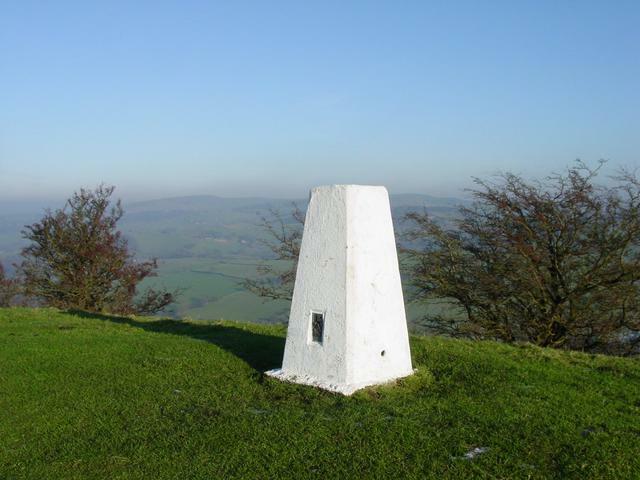 Great place, with excellent views of the Cheshire Plain and beyond. Recommended walk! 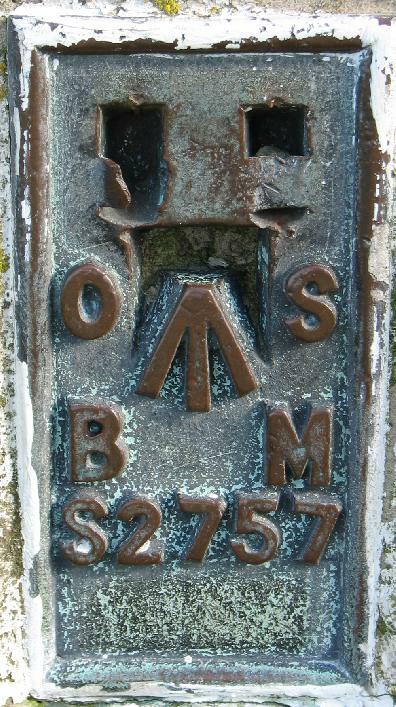 top very slightly damaged; metal cap, shallow letters. 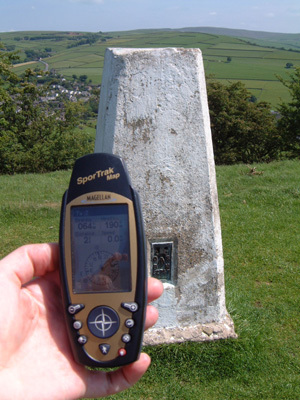 Fine hill & view, a popular spot. 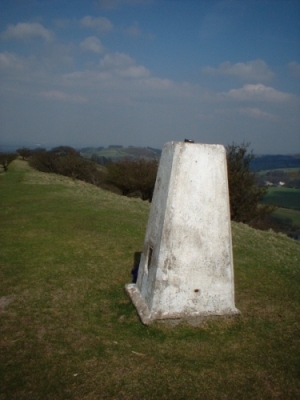 Hill with a lumpy profile. 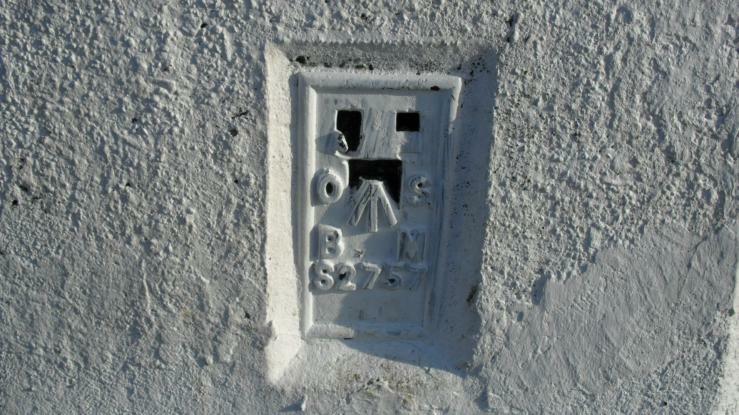 Plug intact; 2 sighting holes open. 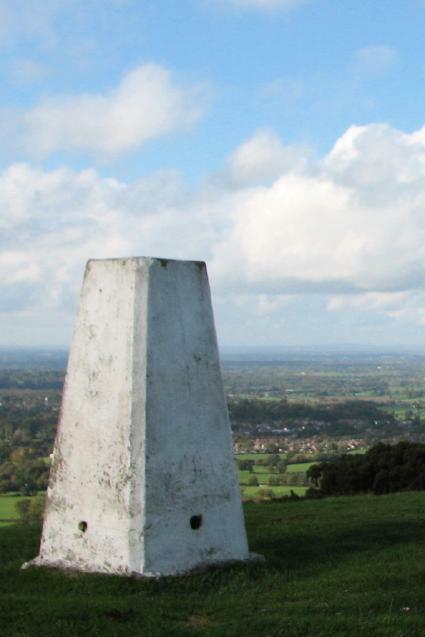 Long-range views over Cheshire. Metal plug intact. 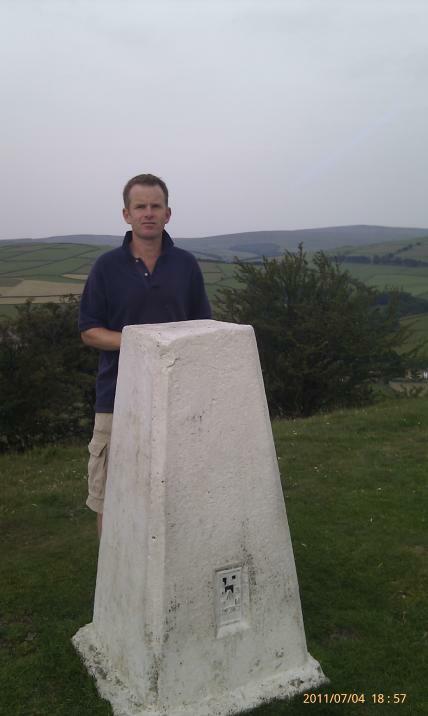 What a superb ridge - first time I've been up here. 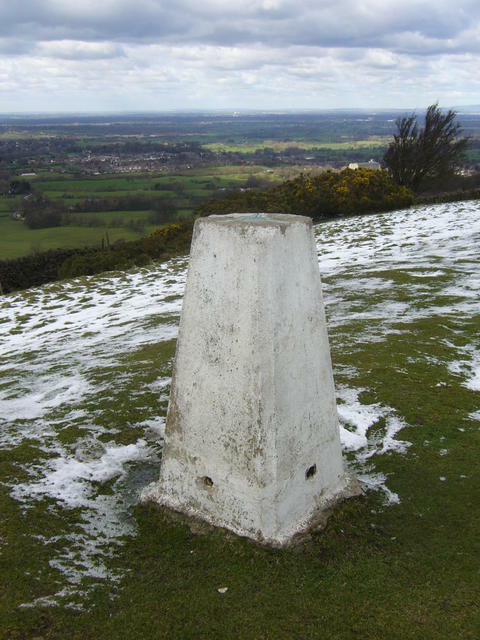 Views over Macclesfield to west and Rainow to east. Walked up from Hurdsfield via the canal towpath. 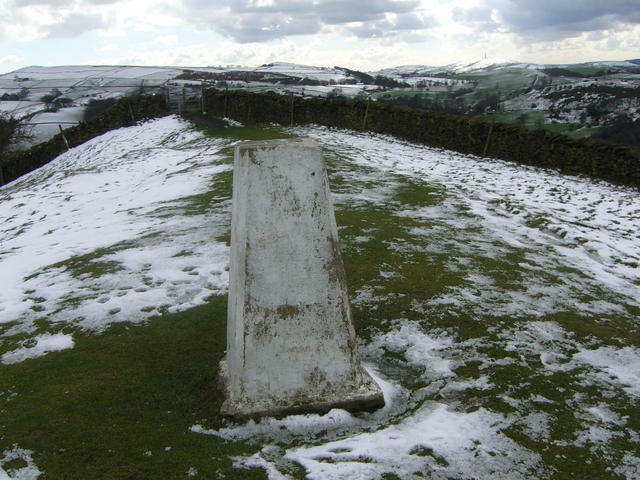 Kerridge Hill 313 metres Looking east towards Rainow. 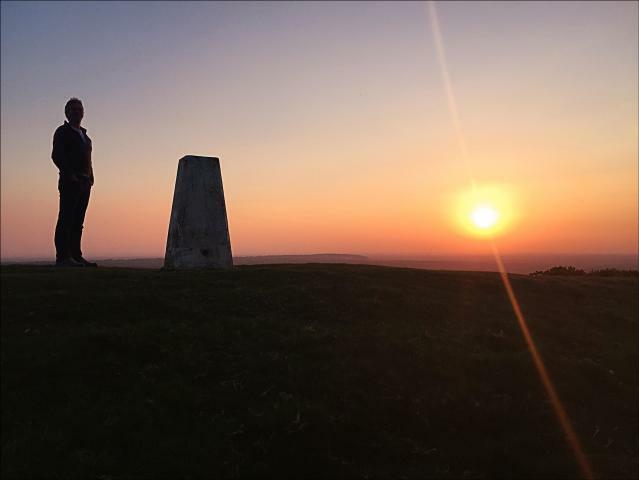 Smashing views all around on this one. 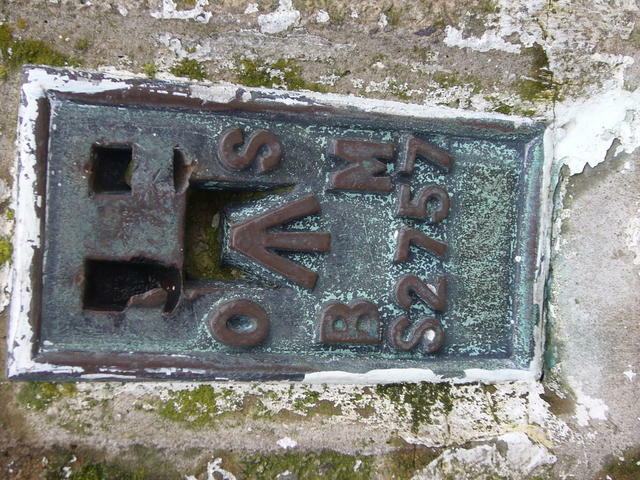 did it as part of the cache nearby as you need info from it to complete the cache. 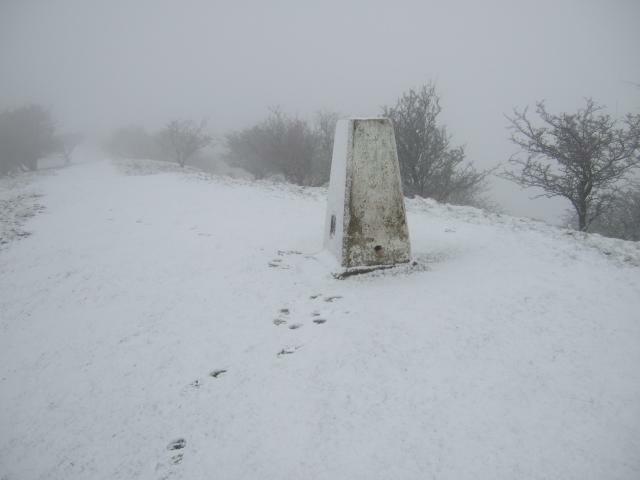 Pleasant stroll up to this trig, snow fall from yesterday makes it a winter wonderland. Easy access from road to west. Vgc. 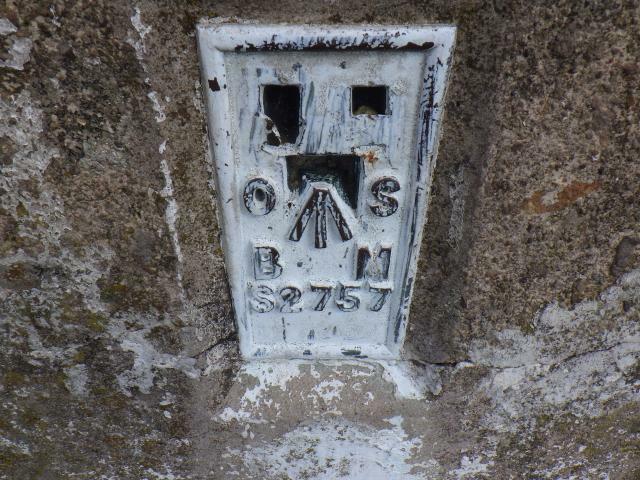 Easy access from a number of directions and on public right of way. 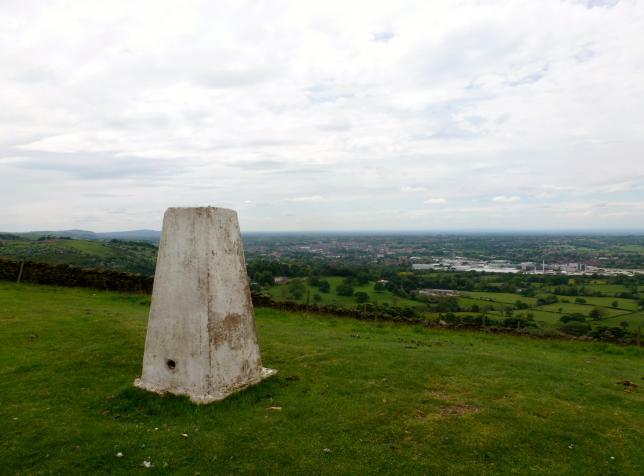 Good views over Macclesfield and beyond. 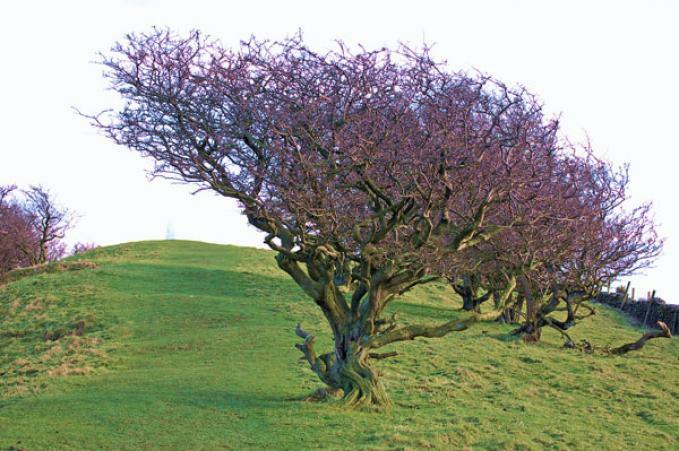 Numerous visits to this hill top over the years as its close to home. 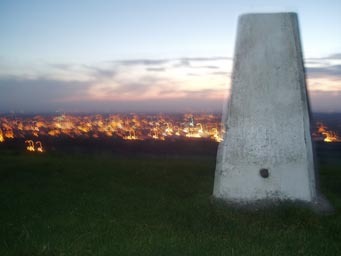 After a day spent at a frustrating meeting it was good to escape up onto this hill before night fell. 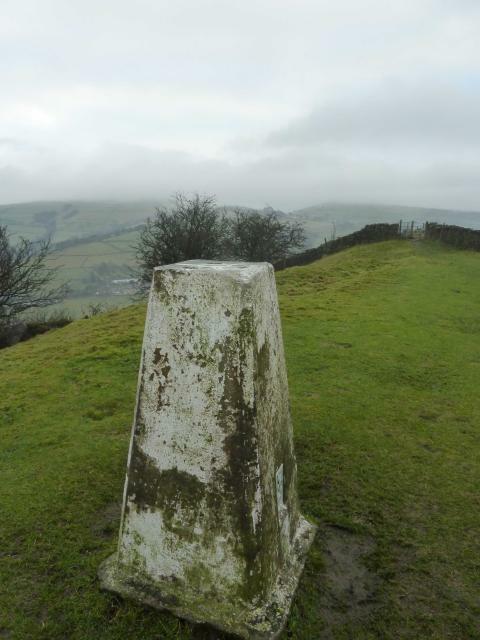 It was a real scamper up from Bollington in failing light but well worth it. 3/31 for the day. 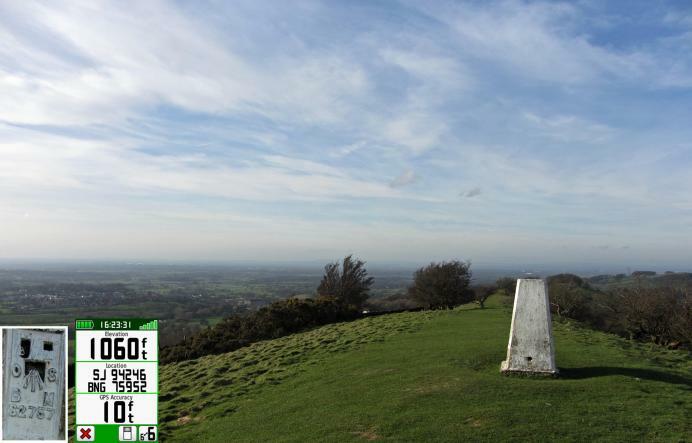 Found my 400th geocache on this hill! Like Teasel found this while chasing GC9910. 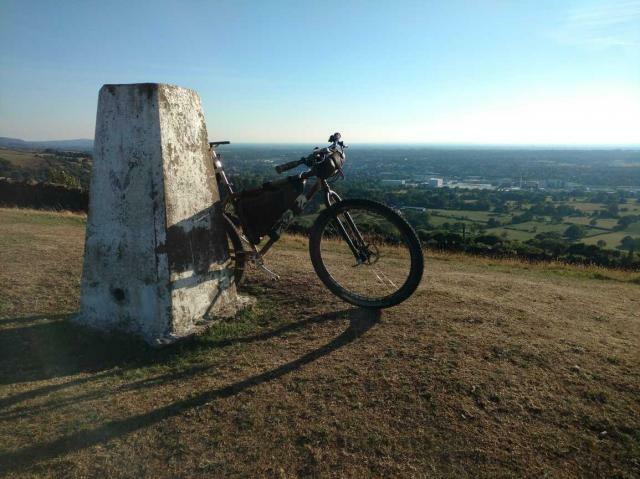 Lovely clear day, super views. Nice views! 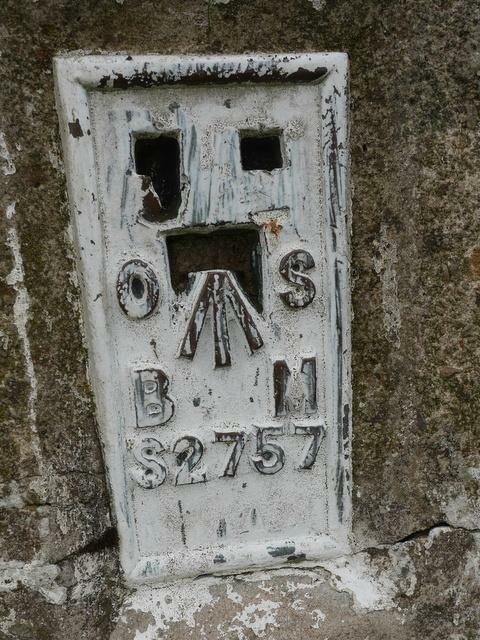 Did as part of geocache GC9910. Walking in to Windgather for a spot of cragging. 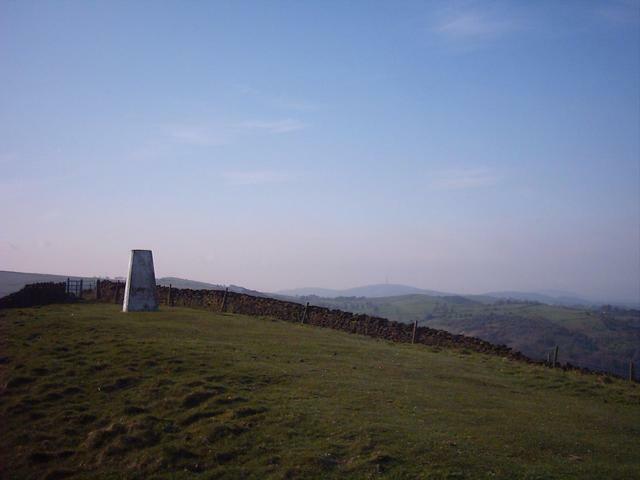 No car back then, so got bus to Bollington and walked to Macc via the crag and a lot of other places. 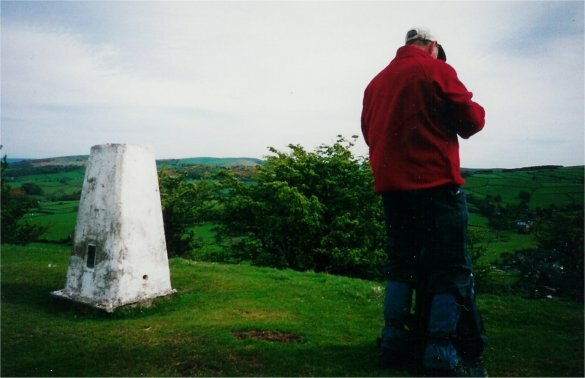 An evening hike in my long-ago Venture Scouting days.